Google undeniably sets the standard for attracting online traffic and increasing web site revenue through the more than 200 known ranking signals it implements. Although there’s no way for marketing and SEO experts to ever discover the exact nature of the ranking algorithms Google uses or how often they’re updated, there are certainly certain factors that can help you improve your web site visibility if properly implemented. Google ranking factors aren’t necessarily a precise science, but they can help you navigate some of the more mysterious aspects of SEO and help you gain an advantage over your competition. How Can You Improve Your Organic Rankings? Organic rankings refer to web sites that appear either at the very top or within the top three listings on Google’s search engine results page (SERP). These are unpaid rankings separate from advertisements that garner greater visibility because they pertain directly to the search terms that are entered or match the exact keywords and phrases that are used. If you’re wondering why organic rankings are so important and even more preferable to paid clicks, it’s because they generate more genuine interest in your business, products, and services. Users conduct searches with a certain purpose in mind, which means your content should be tailored to match keywords and phrases that are most commonly used in your industry and by your target audience. Google has very strict criteria that they factor into all of their local search results rankings. The first thing you need to do to improve your local rankings is create a Google My Business account, if you don’t already have one. Google My Business gives you an online platform to define your business and include vital information about the services and products you’re offering. As a result, you can then attract more local customers to your business. Your account should include the following information: your address, contact information, and hours of operation. 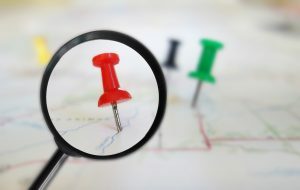 When people search for certain products or services in your area, Google will use their location information to match them up with your business. Google’s index of local businesses in any given region is practically infinite. By using citation signals, Google can effectively measure the popularity of your business in your area. Citations are essentially references to your business that are included on other people’s web sites, blog posts, social media accounts, and so on. Any time other sources reference your products, services, or company name, this information factors into how well you rank on SERPs. Additionally, Google can also showcase results based directly on a user’s location at any given time even if they don’t specifically enter the name of the city or region they’re looking for. For instance, if a user is currently in Toronto and are looking for a local dentist, Google will present them with a minimum of three dental clinics that are within the closest vicinity to where they are. Of those three, Google will rank the one with the best or most reviews and ratings at the top. Google Maps also uses a user’s location to determine the closest business based on their request. NAP stands for name, address, and phone number. You need to make sure that all of this information is consistently displayed across your web site and anywhere it appears. For instance, the information displayed on your Google My Business account should match the information displayed on your web site exactly. Otherwise, you run the risk of confusing your prospective online customers and even inadvertently discrediting your own business before you’ve even had the chance to build up a strong customer base. These days, people tend to always check online Google reviews before making a purchase, regardless of the amount of money they’re spending or what they’re buying. For that reason, it’s important that you deliver the best possible customer service while interacting with your customers whether it’s in person, over the phone, via e-mail, or even during live chats. Make sure that all of their questions are answered to their satisfaction and their needs are met. At the end of every interaction, you should be encouraging your customers to rate your business and leave a positive review. Keep in mind that customers are far more likely to leave bad reviews after having a negative experience, so it’s important that you actively make a point of asking them to go online and leave a good review when they have a good experience. By now, you should be completely aware of Google’s mobile-first index. Mobile searches have far surpassed desktop and that means it’s no longer just a suggestion for your web site to be mobile-friendly; Google has actually made it a requirement. Web sites that fail to comply with the mobile-first index take a lot longer to load and their content might not be properly formatted on mobile displays. This can cause people to leave your web site prematurely and drive them directly into the arms of your competition. Page loading speed is another essential Google search ranking factor. The longer it takes for a page on your web site to load, the more impatient your users will become. Statistically, users are more likely to navigate away from a page if it takes longer than three seconds to load. That might not seem like a lot of time in the grand scheme of things, but it can feel like an eternity when you’re trying to make an online purchase or are limited on time and want to make a quick search query. Numero Uno Web Solutions is a professional SEO company located in Toronto, Ontario. We’ve helped many small and medium businesses build strong online presences and strengthen their SEO and online marketing strategies. To learn more about how we can help you optimize your web site to attract more customers and organic traffic, contact us today!